I popped into Nike Town yesterday when I was showing an American friend around the west end, just so I could fondle some Vaporflys...but I've just bought two pair of shoes so I wasn't about to give into temptation. 4 miles today in the cold. Saw a council worker putting a dead fox into a bin bag. 5K tomorrow - I really hope the track isn't slippery because I don't have any spikes. Thanks for the good luck wishes, folks. Currently loading some carbs in the form of my Dad's banana bread. Poor old fox, Cal. Good luck for your 5K. My 20 is a trail race, Cal. I did the HM version last year, covered in tinsel and baubles and it was a really nice event. It's through forest and heathland on the Norfolk/Suffolk border. The trails should be quite firm as it's been dry here. The forecast is a max temperature of 2C so will have to wrap up a bit. It's straight in the car afterwards and down to Teddington for the Welsh family Christmas thing. Think I might whiff a bit by then! And one majestic heron in a pond. 13.2 miles done, mostly in the dark, with quite a lot of grumbling from various body parts, but hey, it's done now and I can relax. Cal. Well done on your track 5k. Hmm to the mulled wine! Hope the 20 miles went well Will and you are enjoying Wales in the meantime. I'm trying to motivate myself right now to go out and do a 12 miler - in slush and freezing fog - nice! Last run was Friday evening in the dark including 8 x short hill sprints and 8 x strides. Tried to concentrate on good running form for both. Out on the snow shoes for the first time this winter season yesterday so missed a short recovery - it won't matter. Good efforts, Cal and Hazelnut. I definitely prefer winter to summer running, but no snow shoes required in Norfolk just yet! Well, Saturday went very well for me and I've just done 2.5 recovery miles, which have eased the aches from my longest run to date. Super! Well done Will. Getting your first 20 miler done in good style is a great confidence booster. I did do my 12 miler yesterday (well it was 11,98 miles - oops - I ran out of road). As expected it was pretty soggy underfoot and I nearly slipped over twice but managed to catch myself in time. Despite the tiring outing the day before the legs felt okay and I put in a few miles at just slower than MP on average towards the end of the run and could probably have done a few more. One more decent week of training planned then a cut back week for Christmas week. Brilliant, Will! That's incredibly encouraging since the conditions were tougher than your marathon should be (which one are you doing, again?) Amazing support from your family, too - a lot of people wouldn't want to go out and stand in the cold for over three hours. Hazelnut, do you recommend P&D? I know a lot of people like it and I have the book but can't help thinking it's designed for younger, quicker-recovering people than I. But since a sub-4 is on the horizon (if not Spring, then hopefully Autumn) I'm thinking about it. I'd have to modify it a bit as I am an avid parkrunner and I never run those things at an easy pace, but then I'm fairly used to doing a parkrun followed by a long run on the Sunday. Anyway, a 6 mile progression run today (actually 4 miles progression with a 1 mile warm-up and cool-down). Aim for miles 3-5 were Chester pace, next marathon pace, sub-4 pace, and I nailed the Chester pace but was slightly too fast on the other two. Certainly felt like hard work so I obviously have some work to do if I want to hold those paces for 26 miles. At least my niggles didn't bother me too much. 10 miles in the dark, early this morning. Saw a fox using a zebra crossing. Rolled my ankle one mile from home. Hopped, swore, leaned on a wall then continued. Not the first time I've done this exact thing so hopefully it won't impede my running too much. Good luck for your race Matt. I hope you are recovering well Will. I hope your ankle isn't too bad Cal. I got an almost 8 minute PB off P&D so it did me some good. I've done 2 cycles of it in the meantime one with the 18 week plan for up to 55 miles and one with the 12 week up to 55 miles. I found the 18 week one too long for me at the time and the 12 week more or less ideal. The plans are tough with the LT runs, long runs with big MP chunks and the intervalls but they do build over time. I found one of the key things was to make sure I ran the easier runs easy. I'm not so young myself at 44 (nearly 45) but could cope with the recovery schedule ok - my recovery powers seemed to improve over the duration of the plan. If you have enough time you could put in a few extra recovery days as needed. Regarding parkruns: the plans do include a few tune-up races followed by long runs - maybe you could do these via the parkruns although 5k is a bit short. What has your mileage been like in the last few months? If I remember correctly you had been putting in some 40 + weeks fairly regularly so the mileage wouldn't be a huge shock. A significantly increased mileage + some of the harder sessions + your niggles could be a bad combination. For me a couple of crappy pre Christmas days (work / life in general) but I'm still out and about running. Short recovery on Monday because I felt like it. The last 2018 group trot yesterday evening on icy roads. We were joined by a new guy so the pace was gentle to make sure he could keep up okay which he did. Hope your ankle is OK, Cal. Nice fox sighting - he/she was obviously a wise one. My marathon debut will be Manchester, one you know well. Glad you're getting out and about, Hazlenut, and I hope things perk up. It's an up and down business this life lark. P + D sounds like something perhaps for when I've done a couple of 26ers! Ah yes, you did say, Will. Good choice. Quite sorry I'm not doing it next year. Hazelnut - I peaked at 56 miles before Chester so I'm OK with the mileage - it's more the speed work that concerns me. Not just the injury potential, but I don't really like to run anything less than mile intervals, and that's an every-other-mile-fast kind of deal. I'm borderline autistic and partial mile splits with rest intervals don't gel well with me. I don't like to stop during a run. If I do stop, then I have to reset my watch and do the next section as a new run. Still have the dregs of a cold but put in a 5K at HM pace in the cemetery this morning. It cleared my chest a bit and I have felt better since. Some noisy Jays about this morning and I chased a few squirrels too. Managed to read a few gravestones too, which showed me I wasn't going too fast. Went to see Santa this avo. Hmm - you would need to replace the intervall training with an alternative then Cal. The only session with mile intervalls is the 3 x 1 mile towards the end of the plan with recoveries of 50-90% of the rep time. The recoveries aren't supposed to be a standing rest but keep moving at a slow jog. The other sessions range between 600m and 1200 reps with the 50-90 % recoveries. The 3 x 1 mile session is very tough I found - one of the terrible three (the other two being a 7 mile LT run and a very long MP section in a long run). All of those need building up to. I would try to mix the healthy with the unhealthy snacks Will so you don't end up feeling you are missing out on something. Enjoy your Christmas holidays and I hope your cold shifts quickly. Good that you have recovered well from the 20 miler. Talking about intervalls: I did my first set of longer intervalls in a while yesterday. 6 x 1k with 2:30 jogged recoveries. Did a 2 and a bit mile warmup with some drills which I have made a habit of as it helps to prepare my mind for the coming effort. The reps were a few seconds off the pace I would have liked them to have been but I have recalculated my training paces based on my 10k and mara PBs from this year and it might take a bit of work to get the pacing sorted. I always find it very hard to run at a pace less than my 10k race pace in training anyway. That sounds hard, Hazelnut. I find it hard to get up to 10K pace in training - even HM pace feels ridiculously hard work, given I can actually run at that pace for close to two hours during a race. I did a windy 4 miler (external wind, not the other kind) to test my ankle. Ankle niggled a bit but I can manage on it. I did the exact same thing during the summer so I'm not too concerned at this point. I did make the rookie mistake of forgetting to plait my hair and just went out with it in a ponytail - not a great move as the wind kept blowing it into my eyes and mouth. Not cool. 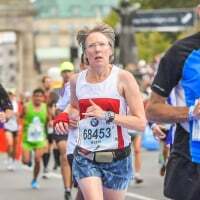 I too struggle to push my pace in training, which is why I like Parkrun so much. When I do make the effort to 'surge' I really like the sfter-high. It's just a matter of getting my legs and heart going in the first place. A very rainy 5K in the cemetery again for me this morning. A bit slower than yesterday as was coughing up a lot of chesty stuff. Did feel better again once I had finished though, so hopefully that's the last of the cold. Mrs Will has gone away for a Welsh night of drinking so it's me, the kids and the kitten. Mince pie baking has resulted in an apocalyptic kitchen. House now slightly straightened. Still home alone. Dropped kids at Ma's and went to Parkrun with Pa. Still not 100% so decided to try to pace him to another sub-27. It was a busy run with some excellent huge puddles from overnight deluge. Dad seemed to be a bit off pace form so I did 2 laps with him before doing a faster 3rd and finishing in 27:07. Still coughing a bit, but enjoyable and met a visiting runner who is 68 and only took up running 3 years ago - now represents GB for age group at duathlon! He zoomed round in 22 something. I managed to get a bit lost on the way to Gunnersbury parkrun today and only just made it (I was still getting my coat off when they started) so I was already knackered as I'd jogged there in my coat. Unsurprisingly, I didn't get a great time (26:44) as legs were full of lactic but it's another one done. Onwards. 15 rainy miles this morning, and the last few felt like hard work. No fox sightings today, and I only smelled weed once, but I did get a lungful of someone's strawberry vape. It was quite pleasant. I sometimes wonder about the ladies who run with their hair flying everywhere - nice running Cal. Nice parkrunning with your dad Will. Enjoy those mince pies. 10 miles for me in 1:30 on Friday in yucky conditions - wet and windy - another half an hour out and I would have been wringing out my underwear. The socks were pretty squelchy already. It wasn't very cold though so it didn't really bother me. Unsurprisingly there were not too many people out - just a couple of dog walkers. Also saw the small group of storks that will overwinter here - rather bedraggled. Yesterday an attempt to do some LT intervalls - at effort rather than pace as I hid from the wind in the woods on an undulating route. Got my workouts on the watch mixed up and messed up the first intervall as a result and nrs. 2 and 3 were also shorter than planned but it doesn't really matter. Out in a bit for this weeks longer run - 12 miles. Will probably be a repeat of Friday's conditions. Seems to be good for my immune system though - haven't caught OH's lurgy. Finishing 2018 on a bit of a high with a marathon today. Last week's ankle trouble was about 90% cleared up so I opted to take it reasonably easy but having been on target for 4.50 at mile 23 a finish time of 4.59 was a bit disappointing but it was largely due to my Garmin being way off and making it a 27 mile race! A nice brisk headwind in the last two miles left me flagging quite a bit at the end but it was still a negative split! The ankle held up well but still feels just a little sore this evening but nowhere near as bad as after last week's half. Might get out for a Christmas Day parkrun but I doubt I'll do more than that until next year! Matt, given your injuries and the conditions, I'd say that's a win, especially if you neg splitted it. Well done, Matt. Any marathon finish is a win. I'm trying to fit runs in around all the festivities, so the 'plan' has gone a bit out of the window this week's, mileage wise. Still, I've managed a 4 day streak to keep the legs ticking over. The kids miraculously slept in and through Junior Parkrun yesterday, so I nipped out for a 5.5 mile progression number, which I enjoyed. Left groin and right knee slightly niggling so the next two days off is probably a good idea. Lots of cooking and wrapping to be getting on with. I shall try to get out for a 14 miler on Thursday . So, wishing all MLRERS a very merry Christmas and a fantastic few days. Here's to you all! Well done Matt. Great that you made it to the start and of corse the finish! Recover well. Happy Christmas! I had a decent run at South Manchester parkrun - 25:29 (considerably better than last year, although that was one of my first parkruns post-injury) plus the two miles there and two miles back, and then had a walk around Sale Water Park. I think I've earned my dinner! Thanks guys, still quite sore two days later so instead of running parkrun I opted to volunteer as photographer instead, I'm in no rush to get out there again so I'll give it a week or two to hopefully ensure I make a decent start to 2019! Another 8 miles logged this morning. I ran back to the parkrun park as I know where it is. It was very misty this morning. We'll likely go for another walk later and then I'll be going back home tomorrow. I didn't get to Christmas Parkrun, although Norwich had 1,100 runners and is now the 4th biggest Parkrun anywhere - surprising stat! My son and Dad got Fitbits from Santa, which they're both already obsessed with. So, I went out for a 2K training run with my boy this morning, which was lovely. He and Dad are going to have their own Fitbit league, with the cousins, so plenty of competition ahead. Also, I bought my Dad entry into a 10K trail race at the end of March, so am going to write him a training plan. He's well up for it! 9 slow miles yesterday, getting the legs going again. Ran across the Marsh, which is now flooded and rammed full of gulls. Felt a bit 'floppy' form-wise, no doubt due to festive food intake. Also, took the kids ice-skating, which was great fun and resulted, amazingly, in no injuries Off to Wales this morning.